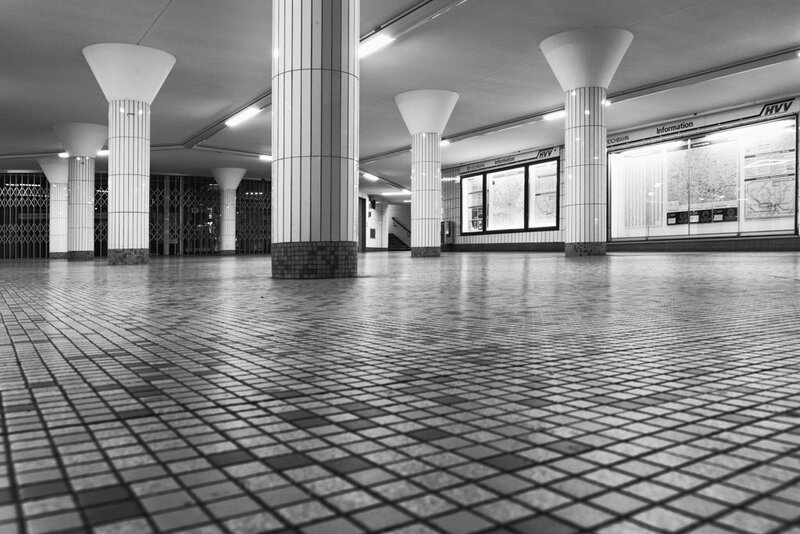 U-bahn station Rathaus, as busy as it is during day-time so deserted it is in the evening. Even at first glance, I knew it had to be an u-bahn station! I like your low perspective, as if seen from a dog's eye level (because after all, there are many dogs on public transportation in Germany!). Hmm . . . do you have to pay for dogs like you do for bicycles? @leonbuys83 -- well, let me say that HVV is more generous than MVV. My friend punched her streifenkarte twice, once for herself and once for the bicycle, and got a 60 euro fine for not buying a bicycle-specific ticket (same cost). And last summer, I got caught without having a ticket on the ONLY day I have ever traveled without one! I was engrossed in reading a book on the tram, and tram ticket machines are coins only and I didn't have the right coins that day, and my monthly pass had run out. Sigh. Must return to Hamburg. I have an illustrator friend who lives in Hamburg (Torben Kuhlmann) so maybe next time he has an exhibition I will head out that way . . .
@jyokota the difference between North and South perhaps... In Hamburg I generally use the HVV app which is connected to my creditcard, so no worry about having not enough money on me. I prefer that app system to the pre-paid cards we have in The Netherlands.